Flowers! 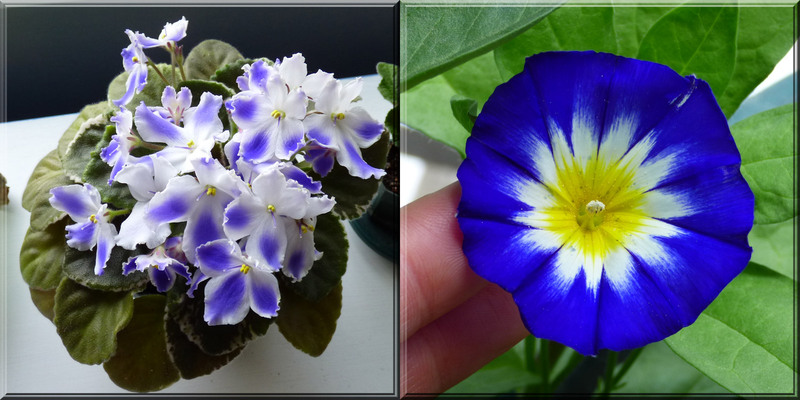 My African violets are blooming up a storm, and my dwarf morning glories that I started from seed in March just started blooming too. Can't have too many flowers! Almost immediately after putting up my post about the awful months of April and May, I was hit with two big blessings. The KVM switch for my computers, that had appeared completely non-functional on Thursday night, got 'resurrected' Saturday, once I figured out the strange order in which I needed to set it up (quite unlike the instructions). So $85 I thought had gone down the drain popped right back out of it! More gushing about the KVM switch is bound to be forthcoming, but I have to thank my job for even learning what they are. Second blessing was Sunday morning, an answer to a topic I've been praying about for a few months. Hit with insomnia and couldn't sleep past 4:30 am as if it was a workday, but that led to big breakthroughs with the story 'The Lark and the Lion.' I've been wanting to write that every summer since 2014, but either been stuck or too busy with other commitments. Thank you, God! Hopefully I can get started in a few weeks! Your African violet is beautiful.